Time was when everyone had to have a yearbook. During the final few days of school, you would run around, getting your friends’ and teachers’ signatures and comments. Well wishes for the coming summer, confessions of un-actualized crushes, premonitions of future success or in some cases, failure. All of these with remembrances of the year past to remind us of who we were. Fast foward to MySpace and Facebook, where YOU get to say who you are. You get to post the photos that show what you are up to, share your favorite books and movies and other details about your life. You can connect with most of your friends, no matter where they have relocated and instead of having to write numerous letters or emails, a quick note in your profile will alert everyone in your network to any changes in your life. People can leave notes on your ‘wall’ which others can read as well. 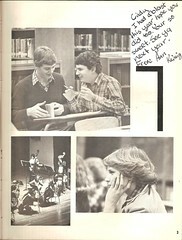 Apparently this new wave in social networking is taking it’s toll on the cherished yearbook. The Houston Chronicle’s article last week details the impact of this on Houston area schools and yearbook publishers but I suspect this problem is being mirrored across the country as the internet and digital technology become our way of communicating and storing our memories. The big question remains; what will happen to these profiles years from now. Obviously if you continue to update and modify your profile as you move on through your life, there will be no ‘snapshot’ of days gone by available to those looking for a quick trip down memory lane. There will always be blogs and social networks and everything else web 2.0. In a recently updated article Business Week says that the bubble this time around cant burst. There’s simply not enough money involved in it, and even if it did, people would just blog about it the next day. The same with social networks.